If I believed in reincarnation, I would theorize that Roberto Oliván, owner, winemaker, janitor, sales director and warehouse manager at Tentenublo was Robespierre or Alexander Hamilton in a previous life, an irreverent revolutionary, an iconoclast who is perhaps a tad insurgent even to his own cause. Proceeding through life irrespective of politics, governing bodies, peer pressure, cultural norms, accepted practices… he is dancing to his own beat, and it’s likely coming from the ringing of the bells used to ward off hail, a century and more ago in Rioja. That ringing of the bells was called ‘Tentenublo’. Evolution is coming to Rioja, whether anyone wants it to or not. For the record, I want it to. For the record, the really large producers do not and they control the Consejo Regulador. Without some compromise, that evolution is going to turn to revolution and Roberto will likely be credited as one of it’s leaders, but I’m fairly certain that in his mind, he’s already won and is proceeding accordingly. His Escondite del Ardacho wines are labeled by single vineyard name, and his Viñedos de Viñaspre wines are blended from plots near his village of Viñaspre. The Consejo Regulador recognizes neither of these designations. In labeling his wines in this manner, he steps right in line with the rest of the wine world; American sommeliers ‘get’ these labels. I think someone needs to ask the Consejo if they have ever heard of a French wine region called ‘Burgundy’? Tentenublo is literally the most simple and uninteresting production facility I have ever seen and some of the greatest vineyards I have ever walked in. That is always a good sign. In addition to the vineyards that Roberto’s maternal grandfather owned and farmed, he’s added a few others, but he still approaches them with the same ethos. Roberto inherited 6 hectares of vineyards when he was 16. Now, at 33, he has 8.5 hectares. Inheriting 6 hectares may sound like fun, but the vineyards had to be worked. At 16 Roberto spent all day in the vineyards, driving to Logroño in the evenings in order to finish high school. This winery owner does not own a Porsche. 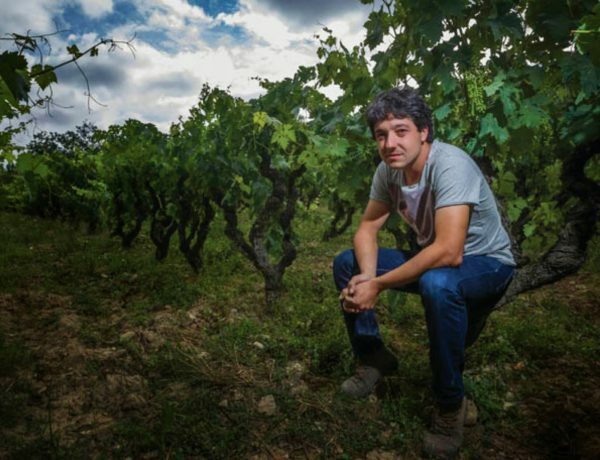 He went on to study Enology at the University of Rioja, and worked in other wineries and in a few other regions (Txakoli, Somantano), before returning to his land in 2011, to start making his own wine. Paradoxically, this revolutionary speaks excessively about returning to past traditions. He wants to “…go back to the way things were done fifty years ago, no chemicals”. Older people tell him Xerico tastes like the wines they remember from their youth, the wines his grandfather’s generation made. His goal for the wines are that they should taste of grapes and fruit, be fresh, and not taste of wood or chemicals, nothing artificial. I asked him if any winemakers in Rioja inspire him and he named someone who is well respected by many people, but he said he is more inspired by the people in his pueblo, Viñaspre, and in his daily life: family, friends and neighbors. Tell me that is not one of the best definitions of ‘terroir’ you have ever heard?! Winemaking inspired by a deep love and appreciation for the people in a specific place. Although he has travelled, and seen several other wine regions, Roberto does not like the idea of leaving his people, land and grapes. When I heard this, I was reminded of the famous story of Noel Verset leaving Cornas for the first time ever, very late in life. Roberto tops out at about 3000 cases depending on the vintage and 2014 was not abundant. Everything is done by hand here, the wines would qualify for organic he says, but he has no time for the official certification. Zero pesticides or herbicides in the vineyards, compost teas, he does not add tartaric acid ever, and all wines are fermented with natural yeasts only. Sulfur is added only at bottling and in minimal amounts. Most of wines are well below 60ppm. Xerico is named for the Xeric Torriorthent soils that it is grown in (3 different plots of marl/limestone) and it is homage to his grandfather. This is Roberto’s conception of an everyday table wine. He punches down by foot. Xerico spends about 6 months in new French oak. The namesake wine, Tentenublo, is a field blend from eight plots near Viñaspre of the usual suspects (Tempranillo, Garnacha) and some old, unusual suspects as well. Old vines, regardless of cultivar, are grandfathered into the D.O.Ca. Truth be known many Rioja’s sourced from very old vineyards likely contain trace amounts of anything from Albillo Mayor to Zammarrica. The single vineyard wines are all bottled under the Escondite del Ardache label. Las Guillermas is about 2/3 Tempranillo and 1/3 Viura. El Abundillano is Garnacha dominate with Tempranillo, Malvasia and others, and Las Paredes is 95% Garnacha and 5% Tempranillo. For the 2014 release, Xerico, Tentenublo and Las Guillermas were all I could secure. But in leaving the other two single vineyards and the Txakoli behind this year, Roberto promised to remember us next year. Roberto inspires me. Not everyone can live the life he does, but we have our own culture in importing and distribution. Yes, it’s a business, and yes, some of that culture is garbage. But it’s a business so we can feed and support our families, and so Roberto can feed and support his. I have always tried to sell wines made with this type of care by matching them with sommeliers and restaurateurs who appreciate them and want to share the story that wine tells. All of the wineries I import fit this category to one degree or another, but Tentenublo joins Sabinares and Angulo (in Arlanza) as producers I just cannot get enough of to keep everyone happy. Tentenublo is only available through 220 Imports in Arizona, California, Illinois and Texas. Supplier liaison Sasha Tokas interviewed Roberto for much of this detail. Thank you, Sasha!